The second HBI article on the architectural history of the Kittredge House. HBI is doing a great series on the history of the Kittredge House. This is the first on the architecture. It’s been a long while since I posted. With Bartlett Events now wrapped up and winter coming soon, I’m hoping to have a new set of posts exploring our history. Meanwhile, Historic Boston’s blog continues to be a great source of info as they publish more details related to their restoration of the Kittredge House. This newest post, with info about Nathaniel Bradlee, the second owner of the house and the architect of our beloved Cochituate standpipe, is no exception. Enjoy, and I hope to have more soon! 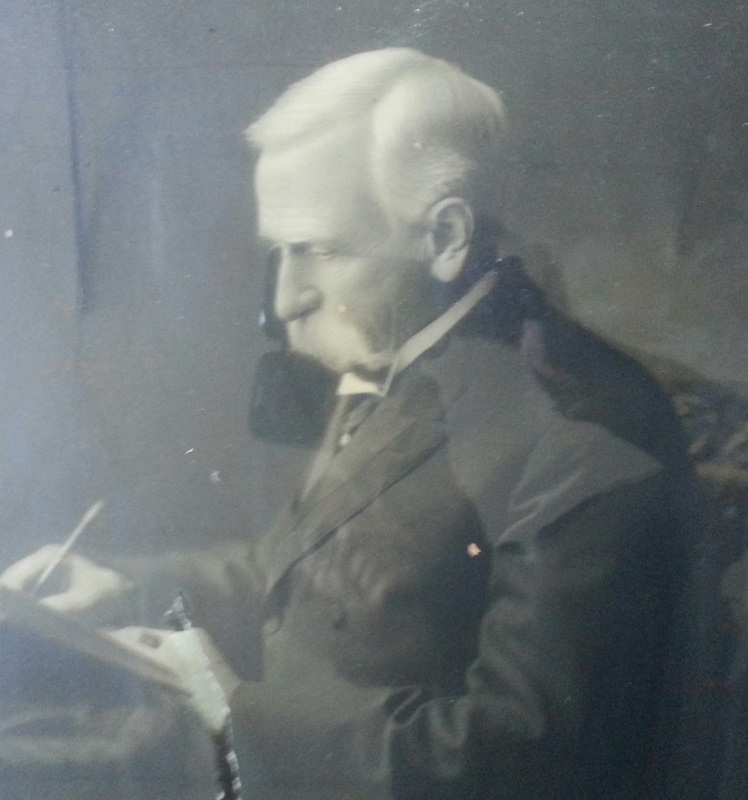 Alvah Kittredge is something of an enigma to local historians. He was clearly enormously wealthy and a very prominent figure in local politics, but we don’t know much about him. 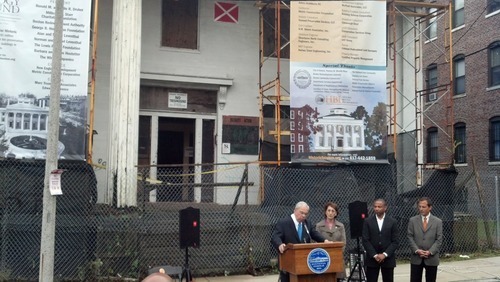 Historic Boston Inc., which is taking on the job of restoring what’s left of his mansion, has been diligently researching him in an effort to learn more about the man whose house they’re rebuilding. It appears their efforts have paid off with quite the jackpot. Kittredge, who helped found the Eliot Congregational Church on Walnut Street, has unearthed two photographs of Kittredge taken before his death in 1876. Read more about their lucky find and Kittredge’s work establishing the church over at the HBI Blog. 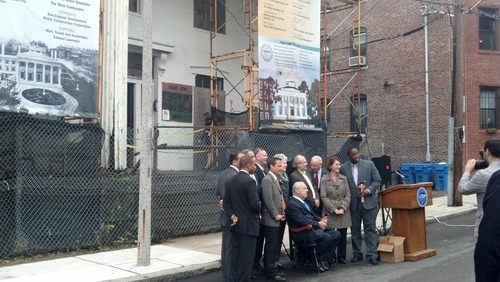 Yesterday I had the pleasure of seeing Mayor Menino and a variety of other luminaries at the groundbreaking of the restoration of the Alvah Kittredge House. After many years of neglect, this Greek Revival gem will finally be brought back to its former glory. The important details are that hammers will start swinging soon after literally decades of planning, behind-the-scenes negotiations, and fundraising by members of Historic Boston, Inc. Kathy Kottaridis of HBI had the honor of passing out the ceremonial hammers, used instead of shovels when HBI launches a new project to symbolize the renovation that will take place. They have an ambitious timeline of work, with plans to have the work complete by this spring and have tenants for the 5 low-income rental units shortly after that. Here are a few pictures from the event. Congratulations to Kathy and the whole HBI team! I can’t wait to see how the project develops. I’m still busy planning Bartlett Events, but I haven’t forgotten about Fort Hill’s amazing history. Here’s some good news: the long-awaited restoration of the Kittredge House is set to begin in two weeks! Click through for all the details. I’ve been absent from the blog for quite some time while I work on Bartlett Events. But fear not, we’re working to incorporate a visual history of the Bartlett Yard site into our programming in collaboration with the Roxbury Historical Society. Meanwhile, it’s almost Patriot’s Day. And while most Bostonians think of Patriot’s Day as Marathon Monday, some of us still remember that it is a celebration of the Battles of Lexington and Concord. Every year, we commemorate Patriot’s Day in Roxbury at a number of locations including our own First Church, where William Dawes left on his ride to warn the Patriots of the impending attack. Don’t miss it! The event at the Church starts promptly at 9 AM. Our neighbor Allen Bush was lucky enough to get a look inside the standpipe this morning. The tower will be getting some much-needed maintenance over the coming months, courtesy of Boston Parks, followed by a facelift to the park itself! The work on the Tower will include interior and exterior masonry and granite restoration; preparation and 100% exterior recoating of the Tower; window repair; glass and glazing replacement; preparation and painting of existing interior cast iron metal spiral stairs and large metal tank; and related repairs to the metal tank; and metal roof preparation and coating. Over the month of March, work undertaken by the hired Contractor, Chapman Waterproofing, will be focused on the interior of the Tower. Moving into the warmer months, you and your neighbors will see scaffolding go up to work on the exterior improvements. There will be no great visible change to the Tower only that it will be better suited/protected from the elements (rain/snow/etc.) The goal is to have this work completed by early summer. The City of Boston Archives posted this photo on their photo page today. I’m guessing that this is sometime in the 1940s, and that some of the folks in this picture were included in the 1940 census. As some neighbors immediately noted, there used to be a thriving business district in Eliot Square and Fort Hill in general. Here’s hoping we see that return in some fashion in the near future! Readers may have noticed that I have been posting less frequently about Fort Hill History. It’s not that I’ve run out of interesting topics…quite the opposite, I have a long list of local history to write about. What’s been keeping me busy is the new project I am working on at the base of Fort Hill on the old Bartlett Yard bus site. 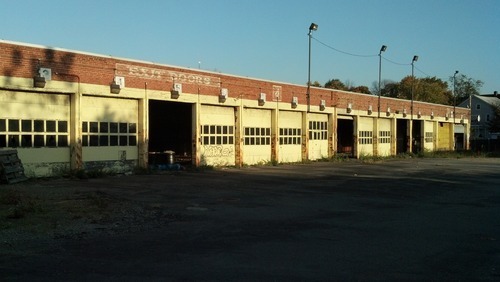 Since October, I’ve been working with Alliger Arts and the site owners to bring events, art, and community gatherings to the now-vacant space over this spring and summer. We’re finally ready to announce our plans to the world! This spring, summer, and fall, we hope you will join us on the site for Bartlett Events, a celebration of the community that will happen (almost) every weekend day! We aim to fill the site with massive outdoor art, events, and community activities for all to enjoy every weekend day. You can get involved in a number of ways. If you have pictures of the neighborhood that you are willing to share, we would like to blow them up and post them on the site. If you are an artist, we want your local art! If you make music, make it at Bartlett! If you are a business, we want to involve you! If you like to play games, have fun, meet your neighbors, or just be outside in an interesting new space, we hope you will join us! I’ve written about the Marcella Street Reunion in the past. Here are the details. If you or someone you know lived in the area in the 1940s or 50s and want to see your childhood friends, you should join. Note that I am NOT the organizer and can’t answer your questions. Please get in touch with Barb instead. Please include your name and a contact telephone number, and please add “Marcella Park Reunion” to the memo section of your check or money order. Some months back, I picked up a copy of something called Ballou’s Pictorial Drawing Room Companion from 1855. This early magazine is a treasure from cover to cover, but I bought it for the 2-page spread detailing 10 elaborate mansions that once graced Fort Hill and surrounding areas from Brookline Village to Warren Street. At the time, Roxbury Highlands had transitioned out of working farmland and into an era of gentlemen’s estates, with huge houses perched on the high points to command sweeping views of the growing city. Soon enough, these estates would be subdivided into smaller and smaller lots and the population would shift from Boston Brahmins and other bluebloods to a largely immigrant population. But for the moment, in 1855, these hills were the equivalent of a gated community or a country club, and the residents lived in style. I had been meaning to put together a much longer post with a map showing the locations of all of these mansions, several of which still stand, but as you can see by the paucity of my recent posts I haven’t had the time I would like to keep up the blog. I had also planned on sharing a scan of the two pages at high resolution for people to zoom into. But Ballou’s was printed on very large paper, 11x17 sheets, and I couldn’t find a scanner big enough to handle the whole thing so I had to scan on several sheets. My first attempt left me with unwieldy PDFs in 2 large files, and my second attempt was better but I managed to leave off 1/2 of the second page. Between all the files I have a complete scan of the pages, but it’s ugly and I don’t have the time to fix it right now. So instead of stitching these together into a beautiful large-scale jpeg that you can zoom into to your heart’s content and plotting these all out on a searchable map and even doing some research onto each of the 10 houses and their owners, I’m just going to place all this stuff here and let you enjoy them that way. You can download 1 1/2 pages from the Flickr slideshow above (pro tip: from each picture’s page, click actions, then all sizes and you can download the pics at any resolution). You can also download the complete versions of each page (including all of 377) from these 2 PDF links, about 7.5 MB each. It’s always a pleasure to see my research used elsewhere. Here, my story on the Trimont Tool Co. led to an unexpected place. It turns out the tool company sponsored a baseball team, one of many in the city at the time. In my late night perusings through eBay, I often see old postcards of a statue of General Warren. I’ve never known what happened to that statue…until now. Mark has put up a complete history of the statue. The short version is that the statue was removed for roadwork and never replaced, and now lives at Roxbury Latin in West Roxbury. Whether or not it should stay there is an interesting question. On the one hand, it would be marvelous to see it return to the street named after him in Roxbury, in front of his former homestead. On the other hand, his history as a slave owner means such a move is unlikely to garner much community support anytime soon. Perhaps the statue could come home, but include a plaque or accompanying text that delves into this past and entices the reader to consider the complicated history of slavery in the US and the modern African American experience? For the uninitiated, here’s a link to another link to everything you ever wanted to know about Joseph Warren. 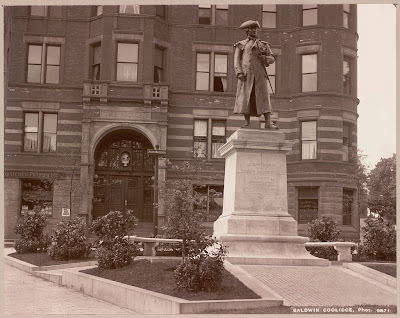 Even though neither he nor his statue lived in Fort Hill, he was a central figure in Roxbury at a time when Roxbury life was centered around Eliot Square, so he’s certainly connected. Today, around 200 people gathered at the new Emmanuel College Roxbury Campus (formerly St. Margaret’s Convent) to memorialize the life of Peter Lee. Thank you to the college staff who let us use the beautiful space for the service and reception during their winter break. Peter was one of the stalwarts of Fort Hill and a man who seemingly knew everyone in the neighborhood. He was also one of the first readers of this little blog, and he actively encouraged me to keep researching. I have a number of posts in the pipeline about subjects he was curious about, and it will sadden me greatly not to be able to share what I’ve found with him. People like Peter rarely make it into history books, but they are the lifeblood of a neighborhood. Peter had time and kind words for everyone, and he is being widely remembered for his many years of community building here in Fort Hill. If you are one of the many dog-owners on Fort Hill, you almost certainly know him from his daily walks with his beloved companion Dancer. If you have ever been to one of our many community meetings, you know him from his presence there. If you have had dinner with some of your neighbors, chances are he was one of the guests. And even if you didn’t meet him under any of those circumstances, my guess is that if you are reading this blog he knew who of you and was actively plotting a way to meet you, welcome you to the neighborhood, and introduce you to someone he knew you would like. Even if you didn’t know him, you have benefited from the work he did to bring us all together. Peter has now moved on into the long and celebrated annals of Fort Hill history. I fervently hope that his spirit of community-building lives on. As we descend into the depths of winter, keep him in mind and do what he would have done. Ignore the weather, get outside, and say hello to your neighbors. Attend a community meeting, keep your sidewalks clear, plant flowers for the spring, host a dinner, make a donation, volunteer, pick up litter, and get involved. It’s not just what he wanted, it’s what makes our neighborhood a great place to live. I’m reprinting below his eulogy, written by his good friend Paul Fallon who was with him in his final days. 2013 won’t be the same without you, Peter. We’ll miss you! Peter Ralph Lee died on Christmas morning, December 25, 2012 after suffering a heart attack and fall on December 14 that caused irreparable neurological damage. The single word that best described Peter is community. He lived in community, he made his livelihood creating community, he thrived among community, he enveloped everyone he touched in community, and he died among community. One of his ICU nurses at Brigham & Women’s Hospital proclaimed, "I want to be part of this village!" as she witnessed the flow of caring visitors who sought Peter’s binding presence until the end. Peter was born on March 27, 1945 in Terre Haute, Indiana, and adopted as a baby by Howard and Valerie Lee. He lived briefly in Holland, Michigan but spent most of his youth in Aiken, South Carolina. Peter graduated with a BA in Biology / Chemistry and a Master of Public Health from the University of South Carolina and began his career in public health working for the State of South Carolina. Peter was founder and first director of the Healthy Communities Initiative at the South Carolina Department of Health and Environmental Control (DHEC) as well as the founding director of the Ecumenical AIDS Ministries of the South Carolina Christian Action Council, which formed AIDS Care Teams in almost 100 churches across the state. Peter received the Robert Wood Johnson Community Health Leadership award, in 1995 for this work. In 1998 Peter moved to the Boston area where he became Program Development Specialist with the RWJ Community Health Leadership Program, Collaborative for Community Health. He became Director of Healthy Communities Massachusetts and Director of the Massachusetts Partnership for Healthy Communities at Health Resources in Action before his retirement earlier this year. Peter’s many civic contributions included serving on the Governing Council and Editorial Board of the national Coalition for Healthier Cities and Communities; serving as co-guest editor (with Len Duhl, the “father” of the Healthy Cities movement) of a special supplement of the Public Health Reports on Healthy Communities in 2000; serving on the steering committee for the Metropolitan Area Planning Council’s long-range planning committee for Metro Boston, the steering committee for the Massachusetts Cardiovascular Health Plan, and the Boards of WalkBoston and Urban Edge. He was also active in his Roxbury neighborhood as co-chair of the Fort Hill Civic Association and the Highland Park Project Review Committee. Peter was a lifelong social activist, inspired by hearing Martin Luther King in a march on Washington, D.C. in the 1960s, as well as a lifelong member of the Episcopal Church. He studied at the Order of the Holy Cross but his vocation for action drew him to the public arena. He was an active member of Christ Church Cambridge throughout his years in Boston. Peter had a lifelong interest in Cuba, where his parents met and lived before he was born. Though he never lived there, he was able to visit. He bore witness to the economic challenges facing that country but also to the beauty of its people, their culture and their tightly knit community. But Peter’s life cannot be measured by titles and achievements alone, for he touched as many through his generous spirit and equanimity as through his official actions. He coined the phrase, “A healthy community is a garden to grow people in” and he tended that garden with more vigor than anyone. In retirement, Peter remained involved in community. This past fall Peter began a volunteer position as archivist in the archeology lab of the City of Boston. The work energized him with the same sense of purpose he savored throughout his life. Peter is survived by his gentle sister Patricia Anna Lee, his beloved dog Dancer, and the thousands of souls he touched during his time on this earth. We thank Peter for a life so well lived, and for embracing us as part of his community. Mark has a great post about the famous clockmakers of Roxbury, swing over and check it out. Another one from Dirty Old Boston. Their caption says it was taken about 100 years ago. This one isn’t technically Fort Hill related but it was too good to pass up a reblog. This work is free of known copyright restrictions. Please attribute to City of Boston Archives. Via ohbenjamin, this lovely shot of our neighborhood landmark.